Remember when we thought of medical charts as inanimate objects, safely tucked away on a dusty shelf in a paper mill known as "Medical Records"? In my prior life, the one I innocently enjoyed before working in health information, I believed all medical charts were somehow pure as freshly fallen snow. They securely sheltered all my personal health information and were completely accurate. I was sure of it. After all, they are the legal record. Doctors and nurses and all kinds of health professionals contributed to them. Someone made sure they were checked and double checked and all information was pristine. OK, so I was clueless. Fast forward a few years into the current electronic age of medical records. Now, through the modern miracle of EHRs, I believed sophisticated computer software was flawlessly cradling all of my health information. Computer chips were spinning at the speed of light to check and recheck all my health data to make certain they were perfect. Bells and whistles and red alerts flashed on the screen if there was any potential discrepancy. The miracle of the EHR did not rely on someone to watch over it. Thanks to the continued advancement of computer science and federal government oversight, my information was more secure, more accurate, and even more meaningful for ongoing patient care. I was sure of it. After all, it is now a government-certified structured electronic legal record. OK, so I was still clueless. Have you ever thought of charts as living things? Neither had I, until I started working with them. As a clinical documentation improvement (CDI) specialist, I have come to realize charts have a secret life. No, they don't date on Tinder or run around the room when no one is looking. However, they can speak to you … and they should. How many times have you opened a patient's history and noticed he or she is documented as being diabetic in one section only to discover that another section of the same chart denies diabetes? Have you ever seen a sedated and intubated patient documented as alert and oriented times three? What about the miracle of organs that have been removed at some point in the patient's history only to reappear in later documentation? Were answers to these mysteries written at the point of care, or was it conceded that someone magical was watching over the narrative, and it was not our place to question such conflicting details? Some may question whether the chart must be a perfect account of patient care. After all, the provider/documenter is well aware of what steps were taken to ensure the best possible patient care. Surely anyone can read the chart and interpret the vital signs, test findings, and medications given to ascertain the care plan and the patient's health status. 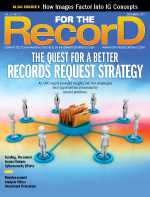 Is medical record accuracy paramount, or is it just an electronic log of discrete data points whose purpose is to promote accurate reimbursement for services rendered? Consider this: Depending on the source, preventable medical errors rank as high as No. 3 among the leading causes of death in the United States. In a Mayo Clinic study with the American College of Surgeons, 8.9% of participating US surgeons reported the belief that they've made a major medical error within the last three months, and 1.5% believe their error resulted in a patient's death. Those numbers should not be viewed simply as cold harsh statistics. Think about the individual patients. Recent statistics suggest more than 700 preventable deaths are occurring each day in the United States. Clearly the electronic age is not the magic wand to prevent such errors, but how we use the system certainly can either help or hurt the patients in our care. The issue is not the system. The goal of achieving accurate medical records to help prevent medical mistakes hinges on the personal work ethic and integrity of each health care professional, including CDI specialists, along the continuum of care. All the little nuggets of lab values, test results, and other data create the chapters of a patient's health care story. This story must consist of clear truths without fiction, a collection of individual encounters or stories over the course of a patient's care, contributed to by everyone who comes in contact with the patient or even just their medical records. In an electronic age in which physicians, nurses, and other team members can contribute to that story simultaneously—and often do so without consulting each other let alone previous entries in the record—that story is alive and active. It no longer exists in a single fixed location somewhere on a shelf where only one person can read or edit it at a time. Many eyes can and will access the story at the same time. Many authors can and will add, delete, or completely confound the story based on their individual focus at a specific point in time. The irrefutable responsibility of being a contributing editor is what many in the health information profession often forget. When I break away from the concept of a medical record as a collection of disparate information centralized in one location and think of it as the patient's living story, the importance of ensuring documentation integrity each time the record is touched is clear to me. I see its power to serve the greater good of the patient and the health care system as a whole. I also recognize its potential to create havoc and harm to the patient and the entire health care system if I do not embrace my responsibility as an active contributing editor … every time. Which life will your documentation live? What kind of life will you give the chart? Follow the principle that each patient is our one and only, and so it follows that each of us is responsible for the documentation in that patient's chart. If we fulfill that duty, we have added value to the life of the chart and, in turn, the life of the patient. That is if and only if each of us accepts that we are the someone watching over it. — Angie Dibble, RHIT, is the clinical documentation improvement (CDI) specialist for Watertown Regional Medical Center in Wisconsin. She has more than five years of experience as a CDI specialist and is an avid volunteer for the Wisconsin chapter of AHIMA.